It’s Valentine’s week! If you have children, you may not be able to see your fridge due to the massive amounts of Valentine crafts. You may get warm fuzzies as you decorate with pinks and reds (I do!). You may even have a special date night planned. If you are like my husband and I, we can never wait to give each other our Valentine’s gifts. My birthday is right around the corner so my hubby always gets me a birthday/Valentine’s combo gift. A birthentine gift? A Valenday gift? We don’t really know what to call it. But the fact remains that he can never wait to give it to me! This year, he got me an uber Oster blender that can pretty much crush anything. And I am SO excited. Little did I know that when I was married and in my late twenties that a blender would scream romance to me…but it does! In this awesome book, myself and 29 amazing fellow bloggers share our most epic mothering meltdowns. Some are hilarious and will have you giggling and perhaps evening “rofl-ing.” Some are more serious and will warm your heart, or have you balling your eyes out and make you want to hop on a plane and go give that mommy a hug. Some will make you say “preach on momma!” But best of all, this little book will reassure you that you are not alone in this wild adventure called motherhood. I hate to break it to you, but you can’t escape epic meltdowns. We’ve all been there. And if you haven’t yet, you will be. Probably enough times to write your own book. 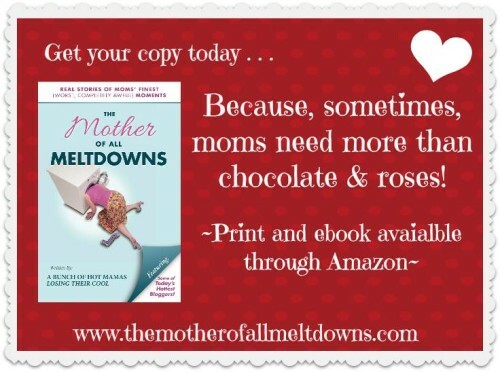 To celebrate Valentine’s Day this week, I am giving away two paperback copies of The Mother of All Meltdowns!!! The winner will be announced on Monday, February 17th. Our awesome brand partners include The Oaks at Ojai, Global Rose, Cariloha, StrataShops.com (Wicker Central), ANEW Wine, and Metropolis Coffee Company, among others. Suzanne Rudge (MapleMouseMama) recently posted…Disney On Ice: Let’s Party! in Toronto #Giveaway! It’s a great book and every mom will relate!! Shared! Look forward to hearing who the winners are! I entered and shared, shared, shared. If I win, it will be going to one of my girlfriends…. OR you can select a different winner! Awesome! If you win, you can totally give it to one of your girlfriends! GREAT GIVEAWAY – SOUNDS LIKE A REALLY CUTE BOOK! Sarah @ Beauty School Dropout recently posted…What does a municipal attorney do, anyway? I agree. My husband and I just read the Five Love Languages and have been learning how to show each other love in the way the other person “gets it.” I totally agree that showing someone you love them should be an all year event!!! I don’t know about you but I’ve had several more meltdowns to have a sequel written. 🙂 Great giveaway.